Whether you are preparing barbecue for your family or a crowd, it's always best to make extra. You won't have to worry about running out of food, and you will probably have enough meat left over for future meals and snacks. 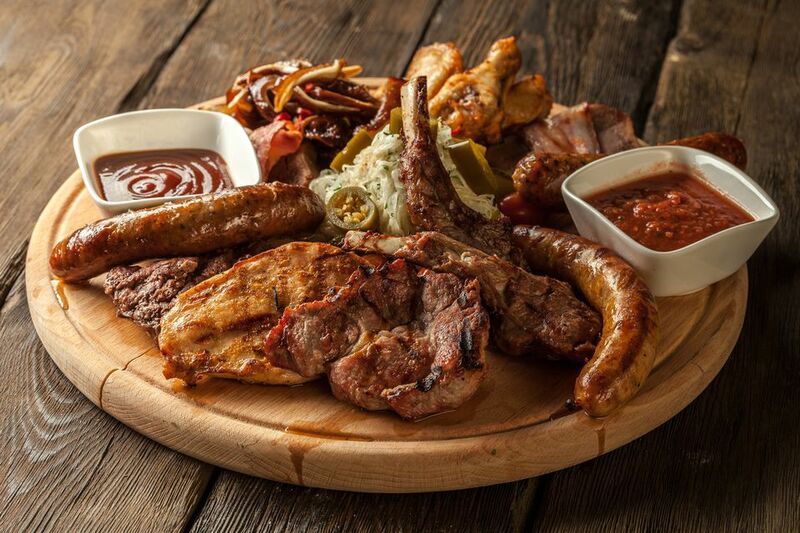 As with other hot foods, once barbecue is removed from the heat source and drops below the safe temperature of 140 F, it must be eaten or refrigerated within 2 hours. If the room temperature—or outside temperature for cookouts—is 90 F or above, you have only 1 hour to eat or store it. For cold side dishes, you have 2 hours from the time the food leaves the refrigerator or cooler (or the temperature goes above 40 F). You might be able to extend that time if you keep cold dishes in a cooler with plenty of ice, but keep an instant-read thermometer handy and check on the internal temperature of the food periodically. To refrigerate leftover brisket, pulled pork, ribs, chicken, and other barbecue, transfer the meat to shallow containers so it will chill quickly to the safe temperature of 40 F or below. Leftover barbecue will keep in the refrigerator for 3 to 4 days. If you don't plan to eat it within 3 to 4 days, you may freeze it in freezer containers or bags for up to 3 months. Vacuum-sealed barbecue will keep even longer in the freezer. Because a vacuum sealer removes all air from the bags, leftover meat and poultry can be stored in the freezer for as long as 2 to 3 years with no loss of quality. Don't forget to label the bags or containers with the name, date packed, and best-by date. It's a good idea to check refrigerator and freezer temperatures from time to time. The refrigerator should register 40 F or below, and the freezer should register 0 F or below. Refrigerator/freezer thermometers are inexpensive and convenient. If you happen to have a power outage, check your thermometer. If the temperature in the refrigerator goes below 40 F for more than 2 hours, discard leftovers and other perishables. Food in the freezer should be fine for 24 to 48 hours, depending on how full it is. When it comes to reheating leftover barbecue, low and slow is the best method. A slow to moderate oven—300 F to 325 F—works well. Keep the barbecue covered so it won't dry out, and stir it occasionally. Or reheat it in a covered skillet or saucepan over low heat, stirring frequently. The microwave oven can is another option, but it tends to heat unevenly. If you do use the microwave, make sure you turn the container and stir the barbecue frequently. 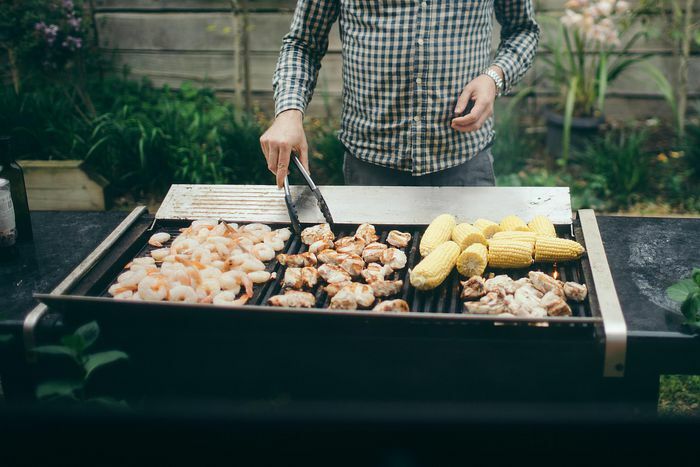 Check the food in several places with an instant-read thermometer to make sure the barbecue has reached 165 F, the minimum safe temperature for leftovers. Avoid re-smoking meats, as they can become bitter. Because it takes so long to reach a safe temperature, you should never use the slow cooker to reheat leftovers. Barbecue frozen in vacuum-sealed can be defrosted in the refrigerator and then reheated right in the bag. A 1-pound vacuum-sealed bag of barbecue will take about 15 minutes to cook in simmering—just below the boiling point, or about 190 F—water. Allow extra time if the meat is still frozen. Leftover barbecue makes delicious sandwiches, or enjoy it as a main dish along with potatoes and grilled vegetables or salads. In addition to the obvious, there are many creative ways to use leftover barbecue meat and poultry. Add shredded barbecue brisket or pork to your cookout baked beans. Make a thick and hearty Brunswick stew with leftover shredded pork barbecue. Add shredded pork, chicken, or beef brisket to a tossed salad. Mix shredded leftover brisket or pork with barbecue sauce and spoon some over a macaroni and cheese casserole just before it goes into the oven, or add some shredded meat to scalloped potatoes. Use leftover barbecue as a pizza topping along with barbecue sauce, thinly sliced red onions, thinly sliced peppers, and cheese. Season the barbecue with cumin and chili powder or taco seasoning and use it to fill taco shells or flour tortillas. Add some refried beans to make tasty burritos. Fill empanadas or egg rolls with shredded barbecue meat, or use it to stuff biscuits or crescent roll dough. Add some leftover shredded beef, pork, or chicken to the cheese in your next grilled cheese sandwich; serve it with coleslaw on the side. Use leftover pork ribs to make a hearty soup. Add leftover shredded or chopped chicken barbecue to your cheese quesadillas.